A year ago last weekend I was in Milwaukee for Midwest Gaming Classics. It was my intention to go again this year, but due to an endless string of flu and other illness it became pretty clear at the beginning of last week I wasn’t going to be going. That Wednesday I cancelled my hotel rooms, yes rooms plural, since I was unsure whether to stay at the events Sheridan or the local Hilton. Of course the cancellation and the let down was all worth it since since I myself came down with the flu the same afternoon I would have been heading up to Milwaukee. As of the time I’m writing this I’m nearly recovered, but I doubt this post-flu reduced stamina would have allowed me to plow through MGC on that Saturday. I guess when MGC 18’ is announced I will plan for next year, and hope my youngest doesn’t drag half as many virus’s home from school as he has this year. In other notes I came across my first Nintendo Switch in a store last week as well. Of course I was in the middle of a hit and run shopping trip, since as mentioned above, I was dealing with a few sick folks at home that week and time was critical, so looking at it let alone purchasing it wasn’t possible. Of course I will openly admit I do have some reservations about buying a Switch now. Reports of broken, and warping screens are pretty concerning, as is the current lack of a library of games. Of course that also brings me to other recent news that Legend of Zelda: Call of the Wild is actually outselling the Switch itself, although details seem vague if that’s just Switch versions or Switch and WiiU versions combined. On a slightly more positive note, part of my hesitations on buying a Switch relate to rumors of new colors being released on the Switch’s later this year too like a cool Bell X-1 Orange. Lastly, playing games this weekend has been a little on the tough side. This is a result of it being not only Easter weekend, but also of the new season of MST3K being released on Netflix. I don’t know if any of you checked it out yet, but once you get past the knee jerk reaction of new characters, and the “bots” voice’s changing its actually pretty good. Talking about the “bots” I might mention that the guy voicing Crow does get the voice down the later in the series you go, but Tom Servo will take some getting use to. I’m not going to say anymore or I’ll start writing a whole article on that alone. Just check it out if you have Netflix. It’s been a light weekend on the buys, mainly since I’m deciding where to go next in collection and what system to focus on next. I know it seems to be my theme for this year so far! Starblade (3DO) – I starting initially chasing down Starblade on the Sega-CD, but after watching gameplay footage on a few different systems it looked like the 3DO got the best version. So I hunted the 3DO version down and we will see how that plays. Sabrina the Teenage Witch: A Twitch in Time (PS1) – Ok, I know what your thinking and yes this is an odd choice. Kids sitcom based video games are probably the second most ignored sub-genre of game after sports games. Looking in a bin at a flea market you’ll see Hannah Montana games breaking up the Madden monotony once every third game if you get my meaning. So how, and why did I decide to buy a Sabrina game? Well, we stumbled across the complete series earlier in the week on Amazon video and decided to watch a bit and then we returned to it Thursday evening for a longer period of time. I won’t get into detail about the sentimental and personal connections to the TV show, but I will say I may write something about it up later, and the game as well. I will say knowing the era the show came out in I had to see if any games where made, so hope that explains the choice. 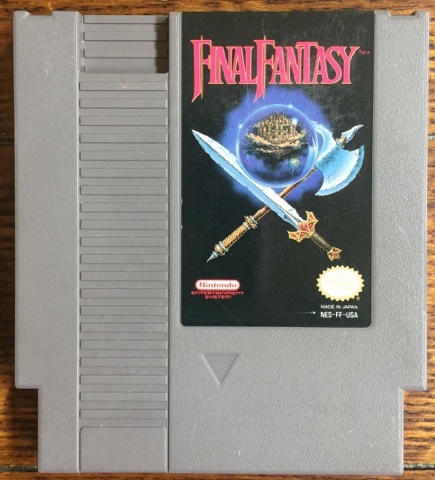 Final Fantasy (NES) ⭐️⭐️⭐️⭐️ 1/2- Right off I can see why this was such an instant hit on the NES and why it started a franchise that is still very much alive and kicking. The game does have some Zelda like qualities to begin with, which has always been a plus to NES players. It’s brightly colored, the sprites are easy to make out, and the game doesn’t require to much explanation to figure out how it works. I will admit the controls did feel a bit stiff though as the sprite only traveled in straight lines, and during play the clues as to where to go next were sparse, which in my first play lead me immediately to death at Garland’s (yeah that sounds evil) Castle. Overall though on my own opinion and not just the years of hype, I can see what this game stands out since the party system, combat engine, and questing all come together well to make this game very special, and highly playable. 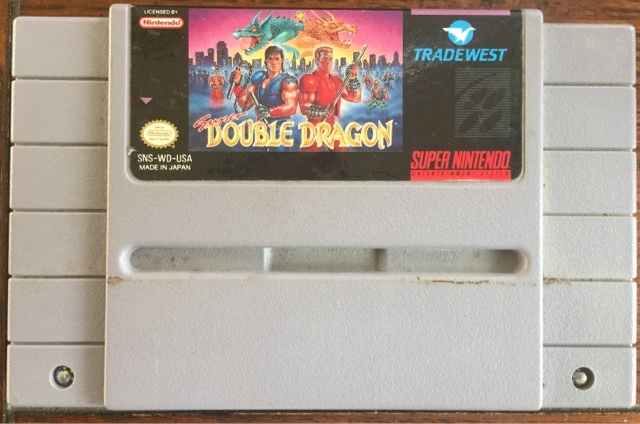 Super Double Dragon (SNES) ⭐️⭐️⭐️ ½ – This is another game that’s haunted the old wish list for a while. As I’ve indicated before I’m kind of a fan of the old Double Dragon series since it has all the right elements for defining the late 80’s and NES games. Super Double Dragon or Double Dragon IV is the franchise’s only real entry onto the SNES in its true form since Double Dragon V would be a one-on-one fighter, and not a very good one at that. After this as I understand the franchise had a great GBA port, but the game would be relegated to nothing more than ports of its NES and arcade versions from this point on until the Neon reboot on XBox 360 a few years ago. As far as the game itself it looks par for a former NES franchise brought to SNES, and the colors and graphics although 16-bit stay pretty true to the NES trilogy, but everything looks better and clearer. As far as control it’s pretty straightforward but muscle memory tends to lead me to only play the A and B buttons and not go for the X and Y, which are used in the game. Overall it’s pretty true to the franchise unlike its successor and it’s been worth the wait getting it. Army Men: Soldiers of Misfortune (Wii) ⭐️⭐️⭐️1/2- Sometimes as with movies or even books you find a game that has a name associated with a franchise or series but isn’t actually part of it. It’s a rarity I’ll give you that, and tends to occur with lesser known franchises like the Silpheed and Sylpheed games I mentioned before, although we get into spiritual succession there. I guess we could say the same for this game too, although not actually part of the 3DO Army Men franchise there is a sense of spiritual succession even if the actual franchise was still producing games at the time. In this game you don’t play as the 3DO franchises “Sarge”, but rather as an adventuresome and imaginative 5 or 6 year old boy, Timmy, who sets out on an adventure to free his green army friends from the evil tan. Admittedly there are some parallels between this game and some of those of the Army Men 3DO franchise, and even Toy Commander on the Dreamcast, such as the green goodies and evil tans, the toy combat in a room by room basis, and in particular with Toy Commander the fact that we are made aware of a child controlling it all. Graphics wise I think their on par for the game type, which means the cartoony presentation works well with the game, but it’s easy to start to see how the graphics of some Wii games are looking a little dated. The characters and backgrounds are pretty solid though, and the hit detection also works well. As far as control this has the typical frustrating Wii controller and nunchuk configuration, and like Ghostbusters on the Wii it’s one of these games where you must aim the main controller at a target which it always tenuous with the Wii’s motion sensing. Taking all that into account I have to say I salute the game (pun intended) for it’s originality and playfulness, but the Wii controls are a detractor. It’s a fairly cheap game to find so, which makes it one of those decide for yourself suggestions. Falling Skies (PS3) ⭐️⭐️⭐️⭐️ – I’m going to be going over this game, as well as Defiance and their associated TV shows in an upcoming article. 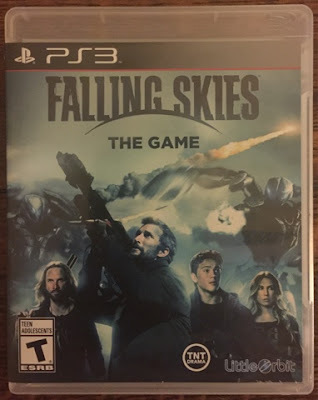 Falling Skies: The Game is a PS3 and XBox 360 title based on the alien invasion TV show that was on TNT. It’s a third person tactical squad based game, which as you may know I’m not a huge fan of but in this instance it’s not too bad. Perhaps they’ve come a long way from XCOM and the first Rainbow Six on PC, or maybe it’s just that I liked the TV show enough to cut it some slack. Graphics wise the game isn’t exactly a stunner, and has a slight PS2 look to it, but you have to figure that this game was never meant to be a AAA blockbuster and might have been made with a very limited budget. Playwise it works well with the PS3 controls, but than again tactical squad games are by nature stiff and grid based but I feel it works smoothly. As far as originality it stays pretty close to the TV show and actually brings in the voice talent of a few of the shows actors like Noah Wyle, and that’s something the Defiance game didn’t really follow through on. The game concept itself though isn’t all that original otherwise and it’s also kind of funny that based on the TV shows premise they decided to go with a game genre synonymous with that sub-genre in games, thanks to XCOM. 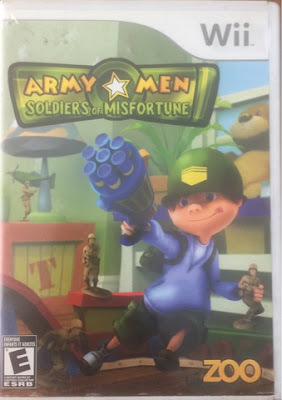 Like the above Army Men: Soldiers of Misfortune this is another fairly cheap to buy and find title and worth checking out if it sounds interesting to you. 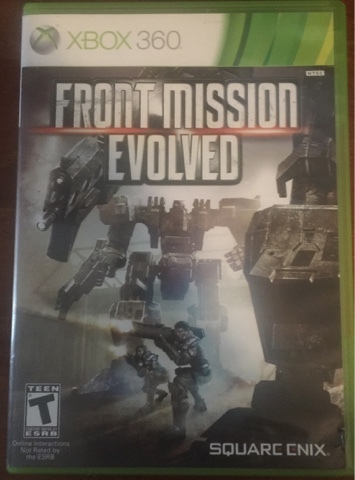 Front Mission: Evolved (XBox 360) ⭐️⭐️⭐️⭐️- Square-Enix never fails to impress me with the range of games they make, everything from the famous Final Fantasy series, to the awesome space combat sim Project Sylpheed. The Front Mission series is another in a long line of Square-Enix games that are unexpectedly impressive. Although Front Mission: Evolved isn’t considered one of the franchises top games it still stands well among the series other games and as a good representation of the series. Graphics wise its pretty on par for a generation 7 game, meaning that they look good but there were games out there that looked a little better, with that said though they’re pretty solid looking and perform well. On the matter of controls this game is pretty intuitive and the tutorial works well in teaching them to you, plus it’s nice and short, and to the point which is always great. The controls work smoothly, and are all placed in spots that make sense and coordinate well with the “wanzer’s” weapons positions. The game concept itself is basically another “Mech” type game, but given some Square-Enix drama to go along with it, so I will give it points for originality there. Most of the Front Mission games do tend to get into the slightly pricier region especially the first one on SNES, and the DS game. This one on the other hand tends to go for a little less, and seems to give me an unofficial theme this week of giving it a try since it doesn’t cost much. Well as previously stated it’s been a hard weekend and last couple of weekends for gaming. Sadly, despite having 17 other games in the backlog, I will be ending this weekend’s play through’s here with just these five. If everything stays cool this next week then I should see some time next weekend to game some more and dig into the backlog. Until then!